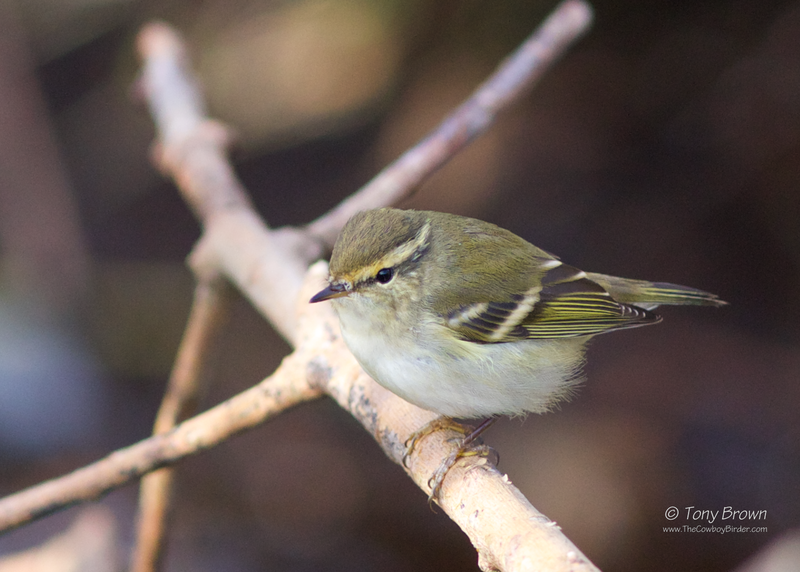 The Cowboy Birder: Surprise Yellow-browed Warbler! Another Saturday morning and I'm back on the patch, it's cold and clear and the sun has yet to rise but I can hear a Yellow Wagtail calling high above Alexandra lake, and there are a couple of contact calling Chiffchaff and then another bird singing from the island. There's a low mist hanging over the Flats but this quickly burns away as the sun begins to rise above the horizon. It's soon evident the Meadow Pipit passage of last weekend has now dried up with just a few single birds milling around the grassland as I walk the ditch towards centre copse. The Brooms are fairly quiet with just a single Reed Bunting and a couple of Skylarks. I make my way along the 'Enclosure' (east end of Long Wood) and two more Chiffchaff are chasing insects and each other. As I reach the gap in Long Wood yet more Chiffy's are flitting around and then I notice a smaller bird jump the gap between two trees - Raising my bins and this big broad supercillium and a pair of wing-bars fill my field of view - YELLOW-BROWED WARBLER! After watching the bird for what must have been just a few seconds (as it quickly worked it's way through an Oak tree) I grab my camera to try and get a couple of shots but the bird is moving just to quickly through the branches and is mostly obscured. I knew James was also out on the patch so I quickly call him and luckily he's in the Brick Pit area and is standing alongside me in a matter of minutes - but the bird is no where to be seen. Having messaged out the news, Jono is also quickly on the scene but the bird is not playing ball and isn't even calling which is making the job of finding it again even harder. For the next hour or so the three of us circumnavigate Long Wood and the trees/scrub in the Brick Pit area, Chiffchaffs are everywhere with maybe twenty or more birds in a fairly small area but that wonderful little sprite is sadly no where to be found - This was my third Yellow-browed Warbler on Wanstead Flats but the first I've self-found making it just that extra bit special. As we're currently stuck in this westerly airflow the numbers of Yellow-browed Warblers arriving into the UK has been low compared with previous years at this time, so it feels like even more of a bonus to pick one up on Wanstead Flats whilst the likes of Shetland and those other typical east coast haunts struggle to record any. As autumns on the patch go it's been fairly quiet with many of our regular passage migrants not appearing in the numbers you would have hoped for, but with Red-backed Shrike and now Yellow-browed Warbler on the Year List maybe this year it's all about the quality and not the quantity. Sadly not today's bird but one of my stock photos from Shetland - Oct 2014.